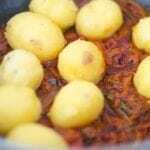 Its my favorite kind of food ever and yes, its because I am Indian. But, I love Indian food because the possibilities are endless. 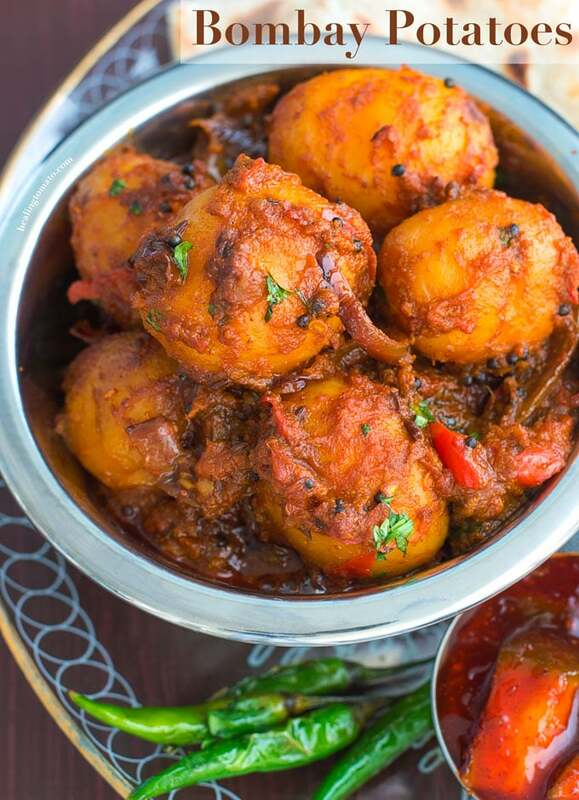 I haven’t seen many Indian restaurants serve this Indian Potatoes here in the USA. However, they are common in England and other western countries. 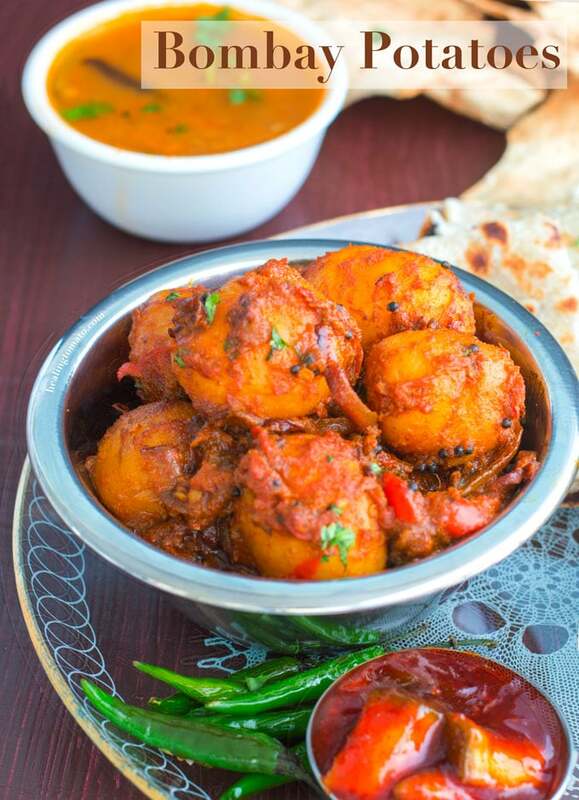 If you like spicy Indian food, you are in for a treat like no other. These potatoes are soft and buttery, making them easy to spice up! I have tried so many different potatoes with this recipe, but, there is only one variety that works best in this recipe. 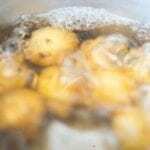 Its the Honey Gold Potatoes (not an affiliate link). I found that they cook evenly and don’t turn into mush when parboiled. These honey gold potatoes can also be great in my tofu scramble recipe. 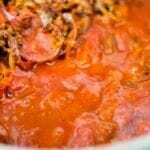 The red bell peppers provide a delicious texture to this recipe. I grated them before putting them in with the onions. The trick is to let them soften a little before adding the sauce. Feel them melt in your mouth with just one bite! 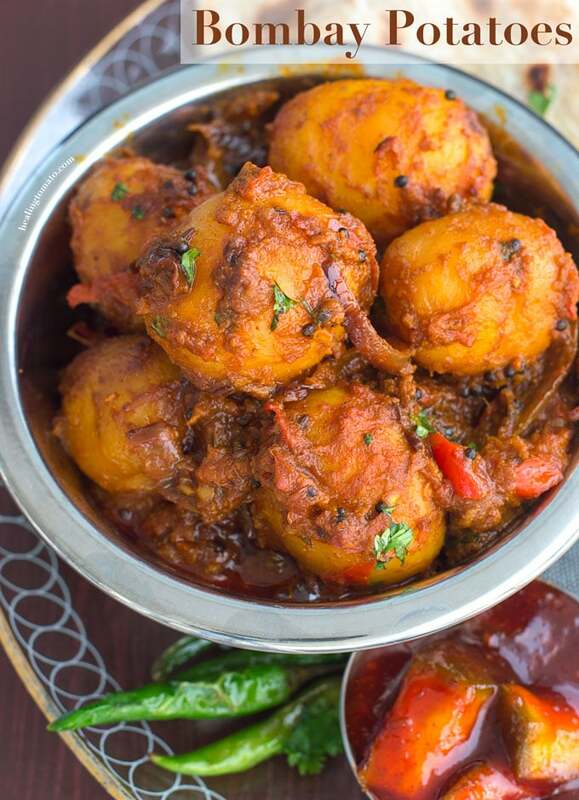 Seriously, how great are these Bombay potatoes for Diwali feast, right?! You are going to have people fighting to lick the bowl! I did make this a little on the spicy side. However, if you prefer a mild version, I give you options in the recipe. 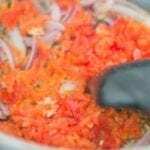 But, this recipe is best consumed spicy, so, stop being a baby and dive in with your taste buds wide open! As you can see, I am very passionate about spicy food. 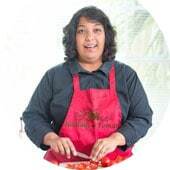 Indian potato recipes and spicy food are at the heart of my cooking and I do get excited when I talk about them. This tastes great with naan and basmati rice, but, I confess to just eat the potatoes right out of the bowl! I guess I was too impatient to wait for the rice to cook. 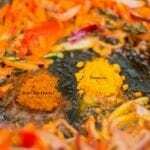 I made sure I used common spices in this recipe, making it easy to order them online or pick them up in your local Indian grocery store. Sometimes, this recipe calls for crazy ingredients like (Affiliate Link) asofetida, black cardamon, panch phoran. That just complicates the dish which defeats the purpose of a quick dinner recipe. If you have these spices, feel free to use them but they aren’t necessary. 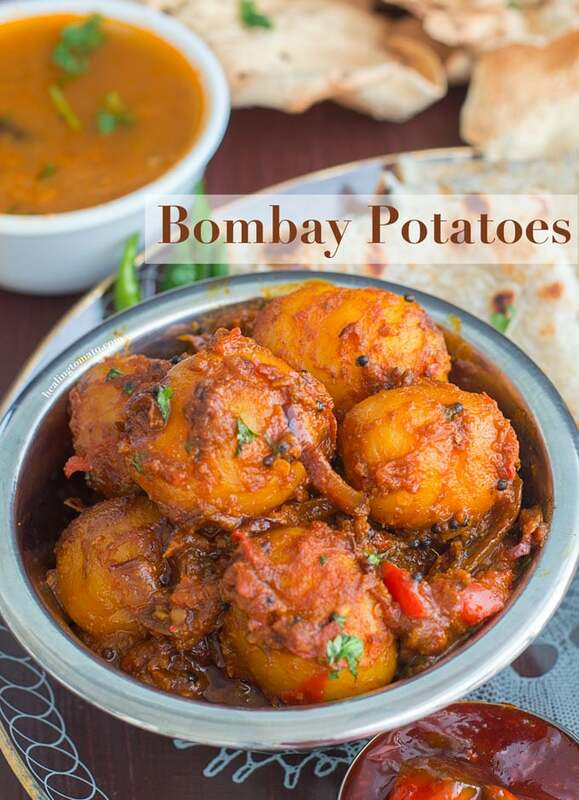 There are as many variations to Bombay potatoes as there Indian spices. 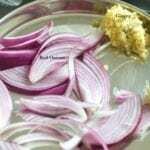 Some recipes include peas, paneer, peanuts, almonds and even mushrooms. The only nuts I would include in this recipe are cashews. They blend well with the potatoes and add a nice crunch. 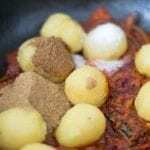 Can Bombay Potatoes be frozen? 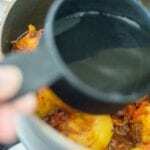 Can Bombay Potatoes be reheated? 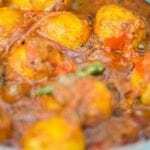 Are Bombay Potatoes Gluten Free? These Bombay potatoes recipe freezes really well. I like to put them in glass containers and freeze them. As always, I try to use them within 1-6 months. 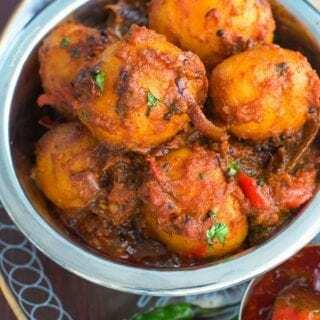 Yes, the traditional Bombay potatoes never use any meat or dairy products. They are mostly spices, potatoes and tomato sauce. If a recipe calls for dairy products, you can easily substitute coconut milk. So, what’s your favorite Indian recipe? 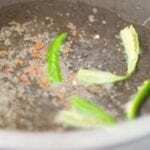 Transfer to a serving bowl, garnish with cilantro and enjoy! Hi. The dish looks amazing. Haven’t heard of this potato dish ever. 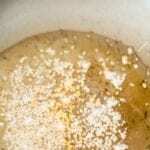 However, post mention that you have used cashews but recipe does not have any cashews used. Can you pls tell how and when to put cashews in the dish? 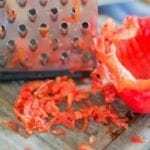 you never mention in the recipe what to do with the grated garlic and ginger? Sorry about that, Bill. I updated the post. Its in step #12. I only have ground Fenugreek and Cumin. Would I use less of those ingredients? This sounds delicious! I have never heard of this potato dish. We love potatoes and I think it will be fun to try for my kids. They are finally leaving the picky stage of childhood! Thank you, Sandi. I think your kids will like it, but, maybe omit the spice. Made this for the family tonight. I found the directions a bit long and a few ingredients aren’t mentioned but I was pleased with the results and would make it again. Thank you for posting it. Thank you Maureen, I just updated the recipe with missing ingredients. I think I would be like you – standing at the stove eating these right outa the pot! These looks just amazing and a real flavorful meal!!! Thank you, Debra. I am so weak when it comes to food. I have zero will power.